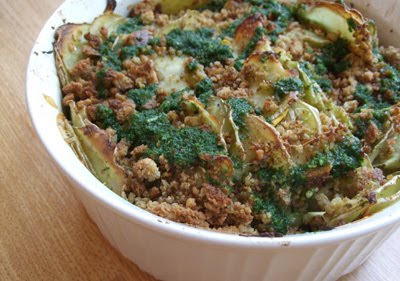 Dress the gratin with this bright green sauce of oregano and parsley. It would be nice to say that Heidi of 101 Cookbooks wrote a bum recipe, but that would be a lie. I was hungry and impatient. Consequently, the potatoes in this gratin were underdone. And that’s the truth, the powdery, uncooked potato truth. Here’s my plan for the next time I make this gratin: I will ever-so-slightly parboil the potatoes, and then I will pat them dry. I also will toss the zucchini with a bit more salt and give the squash more time to drain. Summer squash is wet, wet, wet. Ideally, gratin should be a bit dry and chewy. This gratin, however, was soggy. Tasty, but soggy. Brothers and sisters, can I get some bread crumbs? Amen! Shredded Gruyere throughout the gratin also is a nice touch. Biting into a creamy, salty pocket of cheese is a nice contrast to slightly squishy vegetables and crunchy bread crumbs. One of my favorite 101 Cookbooks tricks is to sprinkle lemon zest into a dish rather than mixing it into the ingredients. It provides a subtle brightness to recipes. Try sprinkling some zest in a pasta serving bowl. Myriad vegetables could segue into this gratin. Consider it an ally in the quest to fully use the bounty of a late-summer garden. Yes, I set the dish the floor for this photo. The best natural light in the house is in front of the sliding glass doors to the deck. Don’t judge! I think my pic looks pretty good compared with Heidi’s photo. Preheat oven to 400 degrees Fahrenheit. Rub a 9-by-9-inch baking dish with a bit of olive oil. Sprinkle dish with lemon zest and set aside. Place the zucchini slices into a colander placed over a sink and toss with 1 teaspoon sea salt. Set aside colander for 20-30 minutes to drain the zucchini. (Consider blotting the zucchini dry, too.) It’s time to prep the oregano sauce and bread crumbs. Tear the bread slices into chunks and drop the pieces into the food processor. Blitz the pieces to your desired bread crumb size. It’s a very personal thing, the size of your bread crumbs. Remove crumbs from processor bowl to make way for the sauce. 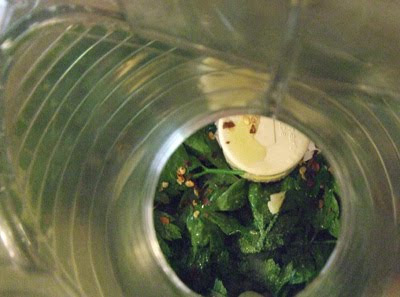 Put your herb garden to use with this oregano sauce. 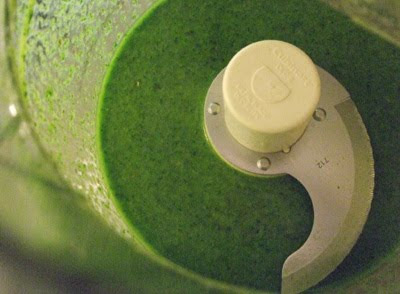 Puree oregano, parsley, garlic, 1/4 teaspoon salt, red pepper flakes, and olive oil in a food processor. To toast bread crumbs, melt the butter in a small saucepan over medium heat. The butter will become fragrant and turn brown. Stir the breadcrumbs into the browned butter. After a few minutes, your crumby little friends also will become fragrant. Don’t let them burn! Transfer the squash to a large bowl. Add the potatoes and two-thirds of the oregano sauce. Toss until everything is well coated. Add the cheese and half of the bread crumbs and toss again. Taste a piece of squash and add more seasoning (salt or red pepper) if needed. Transfer the squash to the lemon-zested dish and top with the remaining crumbs. Check the gratin after 40 minutes. Its doneness will depend on how thinly you sliced the squash and potatoes and how much moisture still was in them. 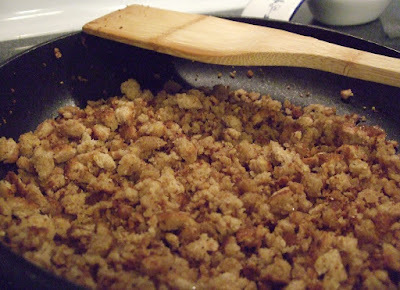 If the breadcrumbs start to get dark, take a fork and rake them just a bit to reveal lighter-colored bits. Remove from oven, and drizzle with the remaining oregano sauce. Serves about eight as a side.